An elite group (Whitcomb and Thieler, can’t get much more elite than two people!) headed to Germany yesterday to compete in the European DN champs. 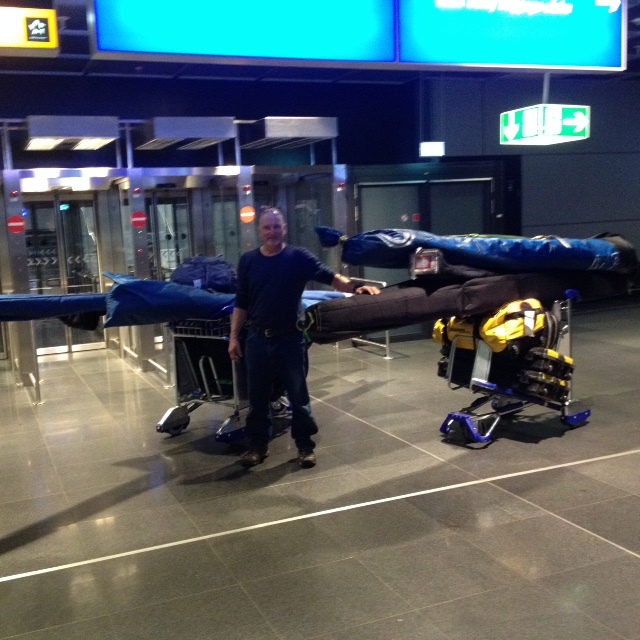 So far so good- all equipment arrived without delay or damage (see photo of Eben w boats at airport) and we were upgraded from economy to business class for the flight free of charge. Business class is amazing. Seats that recline to horizontal, nice blankets, fluffy pillows, great food…. Fantastic. But back to earth now. Looks like we will be driving to Sweden for the races but no official call yet. Stay tuned for bulletins! Hope plenty of sailing going on in NE. Central Lakes champs called on for the weekend, see IDNIYRA site for details. This entry was posted on 02/17/2017 by Commodore James "T" Thieler DN US 5224. It was filed under 2017 Season .